Markets experienced more volatility last week, as perspectives on trade, tech, and retail pulled investor sentiment back and forth. Although domestic indexes were up on Friday, November 16, they still posted losses for the week. In all, the S&P 500 dropped 1.61%, the Dow declined 2.22%, and the NASDAQ gave back 2.15%. International stocks in the MSCI EAFE ended the week down 1.51%. A major topic over the past couple weeks has been the ongoing, significant declines in oil prices. Last week, we did experience one turnaround – on Friday, signs that oil production may decrease next month helped oil prices start to rebound. This pricing increase contributed to S&P 500 energy stocks rising 1.1%. In addition to oil’s current trajectory, let’s examine some of the key October data we received last week: 1. Retail Sales Beat Projections October’s retail sales were the highest in 5 months – up 4.6% from this time last year. While some of this growth comes from rebuilding efforts after the latest hurricanes, the overall data suggests that consumer spending remains strong. As a result, we may be able to expect ongoing economic growth. 2. Inflation Picked Up The consumer price index had its largest monthly increase since the beginning of 2018. From gas to rent to cars, U.S. retail prices rose in October. Inflation is still relatively stable, however, which should mean that the Federal Reserve will continue on its current, gradual path of interest-rate increases. 3. Industrial Production Increased Industrial production only grew by 0.1% in October, but the latest data also indicated that previous months were higher than originally thought. In fact, mining reached its highest point ever in August as production of oil and gas surged. Ultimately, this report paints a somewhat mixed picture for manufacturing: For now, output remains solid, but manufacturers have several concerns, including trade and global growth. Production has slowed since August, and we’ll now have to wait to learn whether this decline continues or rebounds. Examined together, last week’s data may show that the economy still has strength, but questions remain. We will continue to monitor these and many other reports to help gain a clearer perspective on what may lie ahead. As we look to this week, we want to take a moment to say thank you for being one of our valued clients. We recognize the trust you place in our team and are thankful for your relationship during this holiday – and every week of the year. IRS Provides Resources to Help Small Businesses with Taxes* The IRS offers small business leaders helpful information on taxes. Last year’s Tax Cuts and Jobs Act may have helped bolster revenue for many businesses, but understanding tax reform can be challenging. Investing involves risk including the potential loss of principal. No investment strategy can guarantee a profit or protect against loss in periods of declining values. Diversification does not guarantee profit nor is it guaranteed to protect assets. International investing involves special risks such as currency fluctuation and political instability and may not be suitable for all investors. The Standard & Poor’s 500 (S&P 500) is an unmanaged group of securities considered to be representative of the stock market in general. The Dow Jones Industrial Average is a price-weighted average of 30 significant stocks traded on the New York Stock Exchange and the NASDAQ. The DJIA was invented by Charles Dow back in 1896. The Nasdaq Composite is an index of the common stocks and similar securities listed on the NASDAQ stock market and is considered a broad indicator of the performance of stocks of technology companies and growth companies. The MSCI EAFE Index was created by Morgan Stanley Capital International (MSCI) that serves as a benchmark of the performance in major international equity markets as represented by 21 major MSCI indices from Europe, Australia, and Southeast Asia. The 10-year Treasury Note represents debt owed by the United States Treasury to the public. Since the U.S. Government is seen as a risk-free borrower, investors use the 10-year Treasury Note as a benchmark for the long-term bond market. Opinions expressed are subject to change without notice and are not intended as investment advice or to predict future performance. Past performance does not guarantee future results. You cannot invest directly in an index. Consult your financial professional before making any investment decision. Fixed income investments are subject to various risks including changes in interest rates, credit quality, inflation risk, market valuations, prepayments, corporate events, tax ramifications and other factors. Featured Image Notes: All index returns (except S&P 500) exclude reinvested dividends, and the 5-year and 10-year returns are annualized. The total returns for the S&P 500 assume reinvestment of dividends on the last day of the month. This may account for differences between the index returns published on Morningstar.com and the index returns published elsewhere. International performance is represented by the MSCI EAFE Index. Past performance is no guarantee of future results. Indices are unmanaged and cannot be invested into directly. 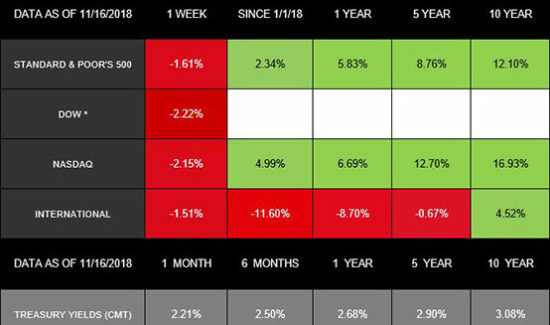 * The 11/16/18 performance numbers for the Dow comparing the past week’s results Year-to-date, and to the previous 1, 5, and 10 years results were not available at the time this chart was published. These are the views of Platinum Advisor Strategies, LLC, and not necessarily those of the named representative, Broker dealer or Investment Advisor,and should not be construed as investment advice. Neither the named representative nor the named Broker dealer or Investment Advisor gives tax or legal advice. All information is believed to be from reliable sources; however, we make no representation as to its completeness or accuracy. Please consult your financial advisor for further information.